You can nearly see the entire filling. The "promo" immediately prior to the Spiced Butter Teppanyaki was the Fish McWrap. 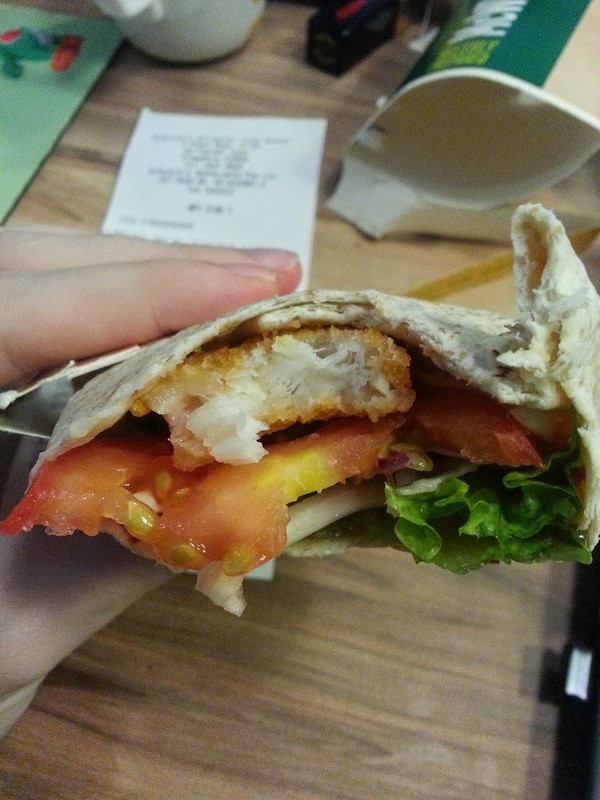 A fish variant of the Chicken McWraps introduced mid-2014. 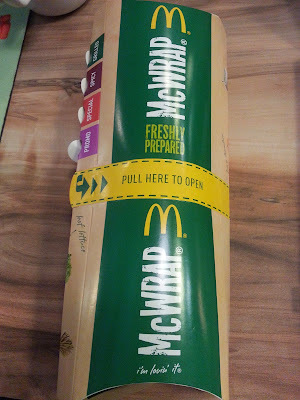 I'll admit, since the launch event I was invited to, I hadn't had a Chicken McWrap since, so I don't know if the quality has dipped since the launch. What I do know is, that this Fish variant was not worth the price paid. 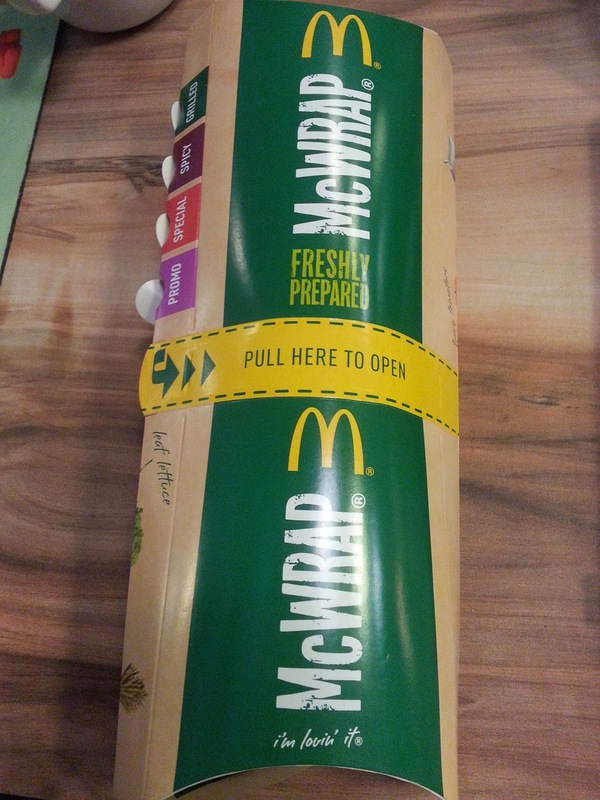 I had a bad feeling about this wrap before I had even ordered it once I had a look at the pricing structure. The wrap on it's own was $5.40, with a small drink it's $5.50, but want to make it a full meal, and order it together with fries? $7.40. 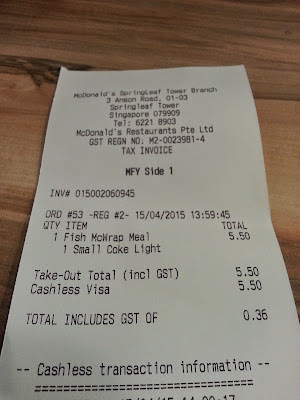 It's completely worse when you think that the Filet-o-Fish entire meal is $5, or $2 on it's own. Seeing that this wrap is only the patty, a single leaf of lettuce, and 2 slivers of tomato, you certainly aren't getting your moneys worth. 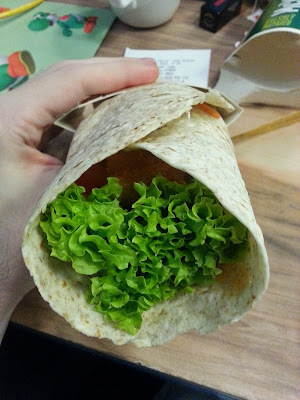 When I had a McWrap in Malaysia it was stuffed with veg and pretty much every wrap I've ever had was more filling than this was. Worst of all, they even promoted it with a "spicy chilli sauce", I can forgive a lacklustre promo item if they have a new, interesting sauce. This sauce might sound interesting to people living outside South East Asia, but around here we have sweet chilli sauce packets and dispensers at McDonald's just like you would get ketchup in any other country. It's pretty much just fructose (like ketchup), and isn't spicy at all - most people that use it just dip fries in it. The sauce on this wrap was just that sauce. It's like if McDonald's said they were having a burger with "savoury tomato sauce" and just used ketchup...pathetic. It still recieves a 1 simply because you still have the ability to have a whole wheat tortilla.